One of the things I love about the Church's Liturgy is its commemoration of holy men and women throughout time. I need these daily reminders of men and women who lived holy lives. The memory of good pastors, pure virgins, faithful religious, holy men and women, and bloodied martyrs are a source of encouragement to me. Each day, their memory holds out the promise of what grace can accomplish in me. This communion of the Blessed stirs up within me a more intense ardor for living the Christian life. For me (and I suspect, for others), the spiritual life can be like a fire burning within the hearth. Left untended, a roaring fire will soon become smoldering embers. We all know that there are many things that we can do ourselves to stir up the flame within us. Praying, receiving the Sacrament of Penance, going to Mass and receiving the Eucharist, adoring the Eucharist, reading Sacred Scripture, doing works of charity . . . can all help us to stir into flame the smoldering embers. But, sometimes we seem too weak or too lazy or too stupid to do what is necessary. At other times, the fire may be burning strong within us, but God wants to do more. For me, the fire often grows because of the witness of others. As much as the saints in heaven stir up within me the desire for greater holiness, it's as though I am so weak that that is not enough. I need to be surrounded by witnesses. Left to my own, the fire would likely fade fast. But God doesn't leave me alone. The example of others is the fuel that continuously sets my heart ablaze. This is so true in my experience that as I look at my life as a pastor and now as a university chaplain, I see that what has been most beneficial to others in terms of my pastoral life is simply my being moved. When I am moved, God is able to use me to move others. In a way, this is very humbling because it means that my pastoral initiatives do not arise from my creative genius, my intellectual astuteness, or my charming personality. Nope. It comes simply because I am capable of being moved by Another. As those whom I encounter every day at the Boston University Catholic Center would be only too happy to tell you--repeatedly--I am twice the age of all of them. But, my experience with these young people is quite similar to the experience I enjoyed while being a pastor. I show up every day and am unexpectedly moved by what I encounter in the lives of the people Christ has put in front of me. Because this post is running long, I won't get into the details. But, this week I encountered so many beautiful examples of the Christian life. I show up at work and discover Christ standing in front of me. I find him particularly in the generosity of life and the depth of prayer that I see among the students and staff at the BU Catholic Center. When I say that they move me, I do not mean merely in some sentimental way. I mean that they move me--almost, compel me- toward Christ. They move me to follow him. It really is something wondrous to witness the power of Christ at work in the lives of these disciples of his. Their witness--manifested in varied ways--also moves my heart with an affection for them. Their witness is fuel. Hanging by my office door is a quote from St. Augustine's Confessions. I've quoted it here before, but I never tire of repeating it. As I begin a new year with our community of students and staff, it is what is in my heart. I write a lot about this topic. That's because I'm moved a lot by the example of those whom I encounter; students, parishioners, the priests, the pastor of the rectory in which I live and with whom I'm conversing as I look up over my laptop screen, the staff at the Catholic Center, and the countless others whom the Lord places in my path. They move me. I pray that the Lord keep placing witnesses like this in my path so that they can keep me moving. Left to myself, I'd move in the wrong direction. In His Mercy, the Lord surrounds me with witnesses who move me towards Him. Recently a friend posted a question on his Facebook page. "What do people mean when they talk about 'vibrant' parishes?" Admittedly, this touches a nerve for me because I think the word "vibrant" is overused, overrated, and nebulous. In the past five years or so, there has been a mad rush on parish bulletins and websites to identify themselves as "a vibrant parish." I sometimes think this is more an attempt to convince the people writing it than it is to attract others. There's something else that bothers me about the whole "vibrant craze." It makes Catholics sound more like we are trying to sell ourselves than we are trying to proclaim Christ. It makes us sound like we think that we are responsible for building "vibrant parishes." "We've got programs, greeters, and a website. We're vibrant!" It's not that telling people about ourselves is a bad thing. But, I think that what's missing is a sense that these things arise from the Lord and from a relationship with Him. Too much effort is being spent trying to be vibrant and trying to sound vibrant. The apostles weren't trying to attract people to Christianity by sounding vibrant. They were preaching Christ and Him crucified. I think the early Church spread so quickly because the apostles and the disciples were marveling at what God was doing in and through them. Each time they were faithful, the Lord produced 30, 40, and hundredfold. Instead of trying to create the hundredfold, we ought to stand and marvel at it. The more we contemplate what we plant, the less fruitful it is. The more we contemplate what the Lord produces, the more fruitful it is. I think the best kind of parish is the kind where people stand in amazement at what the Lord is doing in their midst. The worst kind of parish is the one that is trying to make itself vibrant. I remember a parishioner of mine once telling me that during the Easter Vigil one year, he turned to his wife and said, "I feel like we are all going to be just taken up right now." By that, he meant that he felt like he was part of something so much bigger than what was going on there. Nothing we were doing that night could produce that kind of experience. What he was experiencing in that moment was the Lord! For me, a parish or a Catholic community is not something we build. It is something that happens to us. We suddenly find ourselves looking at what Christ is doing and wondering, "How am I part of this? How was I chosen to be part of this?" A great parish is an obedient parish. A great parish is a people who are following something, being led somewhere, and filled with a sense of wonder at what is happening. A great parish shares the joy of what is happening because it is compelled to share what Christ is doing in the lives of this people. It isn't about saying, "We are vibrant because we have all of these activities going on." It is about saying, "Look at the ways Christ is leading us and forming us! We are so grateful!" 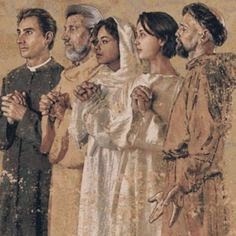 Instead of trying to create vibrant parishes, we ought to form prayerful people, charitable people, Eucharistic people, Sacramental people. Instead of trying to create vibrant parishes, we ought to form people who love God's Word, who worship God with reverence and awe, and who give to the poor, visit the sick, and seek out the lost. Instead of trying to create vibrant parishes, we ought to form a people who can look to the Lord and see what He is doing in their midst. Instead of trying to create vibrant parishes, we ought to form a people who love each other and stay with each other and encourage each other. Instead of trying to create vibrant parishes, we ought to form a people who know how to follow Christ. I'm not saying that those who say it mean it this way, but when I hear the word "vibrant" it always sounds like a sales gimmick. I definitely think we ought to talk about all the ways that the Lord is at work in our Catholic communities. I think we should announce it from the rooftops. But for me, "vibrant" sounds less like witnessing to Christ and more like self-referential advertising. 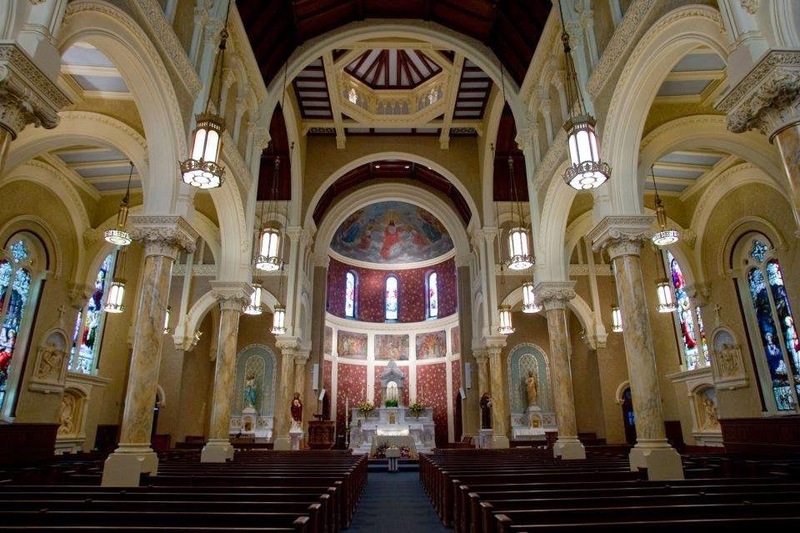 Are there amazing parishes? Yes! Should we strive to be amazing parishes? Yes! But, something about the whole "We are a vibrant parish" craze sounds phony to me. What made Abraham, Isaac, Jacob, Moses, David, the Blessed Virgin, St. Peter worth honoring is that FIRST they were chosen by God. They aren't self-made saints. They were chosen and responded. Too much "vibrant" talk sounds too much like we are responsible for making ourselves a great parish rather than us standing in awe of the mystery of being chosen by the Lord. We can't create great parishes. All we can do is obey the Spirit, follow where He leads, and stand in awe at what is happening in our midst. If I create a vibrant parish, don't go to it. If Jesus forms a people, is working among them, and leading them, follow! You can go to our website at www.bucatholic.com and click on the Donate button. There are different options available. You can write a check directly to the Boston University Catholic Center at 211 Bay State Rd. Boston, MA 02215. You can go to http://www.gofundme.com/dkkbac. There is also an easy to click box at the top of my blog in the right hand corner. I mean how easy can I make it? If you are a regular reader of this blog and find it of any value, I'd be grateful if you'd consider supporting the ministry here at the Newman Center at Boston University. I'd also be grateful if you'd consider sharing this with others. Recently I was tagged in a post on Facebook by someone who was upset about something that one church official said in one diocese in the United States. The person who tagged me in the post did so with the best of intentions and with, I am sure, a desire to find a resolution. My point here is not to discuss the particular issue that was raised in the original Facebook post, but rather to discuss the reaction that followed. Within seconds of the person posting their story, the responses started piling up. "The Catholic Church disappoints yet again." "Things like this are why I left the Catholic Church." The comments included rants about priests molesting children (the original post had absolutely no connection to this topic), attacks on the character and intentions of the particular people in the diocese who were at the heart of the story, praise for a Catholic institution that prides itself on teaching contrary to the Catholic Faith on a host of moral issues, and what seemed like an almost boastful anti-witness of Catholics who have left the practice of the Faith. The anger and hatred towards the Church was not below the surface. It was there on full display. In some instances, it seemed almost gleeful. From what I gather, these comments were not coming from strangers who only had some vague non-personal relationship with the Catholic Church. No, these were Catholics. These were--in large part--baptized Catholics who, given the opportunity, could not resist the chance to dismiss, despise, and deride the Catholic Church. Again, my purpose here is not to debate the particular issue that was raised. Instead, I am interested in the reaction. One diocese in the entire Catholic world said one thing and, all of a sudden, the comments were flying on how the "Catholic Church" is doing something terrible. I know that it probably shouldn't, but the reaction surprised me. It surprised me not because people disagreed with this particular diocese's decision (the issue revolves around a moral issue, but I honestly think the whole situation could easily be solved to everyone's satisfaction). What surprised me was how quickly Catholics were ready to disagree publicly with "the Catholic Church" and how so many of the commentators--some of whom I presume still practice the Faith--were ready to talk about "the Church" as "them" and not "us." If the integrity of one of my friends or family members were being questioned publicly, my initial inclination would be to give the person the benefit of the doubt. I would look for every possible reason as to why they were being misunderstood. And, even in the end, if I disagreed with my family member or friend, I'd do my best to presume that they were acting in good faith. Why? Well, I know that everyone is entitled to those kind of presumptions, but I probably don't always so easily give them to those who are not my friends and family. But, I want to give them to my friends and family because . . . they are my friends and family. I love them. I don't want them publicly bashed or for people to judge them harshly. I always feel the same way about the Church. I've lived my whole life in the Church. I've been a priest for seventeen years. Believe me, I've seen bad decisions and human weakness. It would be futile for me to defend every decision I've seen made by leaders in the Church. It would be futile for me to defend every decision I've made. Do I think there are occasions when people in the Church make decisions for evil reasons? Yes. Do I think that there are occasions when people in the Church make decisions that arise from viciousness or incompetence? Yes. I could write you a list of instances! But, for me, those instances are the exception to the rule. When those things happen, it is those instances that ought to be condemned and corrected. I wouldn't leap from that instance to a condemnation of the whole Church. So, what has happened? How did we form so many Catholics who think of themselves as being "on the outside?" Where have we failed in our Catholic formation? I see it in certain Catholic high schools. In an effort to portray themselves as "more enlightened," they set themselves up as a parallel Magisterium. Instead of forming disciples who follow Christ, they form observers who approach Christianity from the outside. I see it in "skipping over Jesus Christ" and in the "reduction of Christ." Pope Francis has said that we need to return to what is essential. What is essential is Christ and the encounter with him. Sometimes, we skip over this encounter and focus only on morality. Of course the moral life is an integral part of Christianity, but it seems we can't gain disciples by simply fighting moral issues from one trench to the next. We need to begin with the person of Christ. At the same time, we cannot reduce Christ to a nice guy who said nice things and wants us all to be nice. I think another place where we are making a mistake in our formation of people is by concentrating all of our efforts on the "front door." I was recently speaking to a young evangelical and I was complimenting the ways in which evangelicals attract people. His reply surprised me. He said, "We are good at getting people in the door, but we are losing them out the back door. There has to be something inside." Our discussion went on from there to the importance of the liturgy and preaching. While it is of value to teach people how to invite others into the front door of our churches, there has to be something beautiful and true being lived inside. Focusing almost exclusively on "front door" evangelization without a renewed emphasis on faithful preaching, liturgical beauty, solid catechesis, the importance of the Sacraments--especially confession--and a profound experience of the communion of the friendship of the Church will not help to form disciples. "Going out and making disciples" has to be a going out from the experience of living discipleship already. Training people to make disciples will only work if the people we are training to "go out" are being fed inside. To invite those on the outside to come inside, we have to be "insiders." We have to be people who love what we've discovered on the inside and who want to bring others to share in this encounter. It seems that instead of forming insiders who go out, we've been encouraging those on the inside to become outsiders. We have countless Catholics who have gone outside and now stare at the Church as observers. They've been taught that to be an enlightened Catholic means to stand outside and comment on what goes on in the inside. The Church is "them" not "us." This is the anti-evangelization. The Church has its work cut out for it. Many of its own institutions and structures have adopted this anti-evangelization as their primary mode of formation. When Pope Benedict XVI preached at St. Patrick's in New York, he said that to many in the present culture, the Church seems legalistic and "institutional." In the face of this, he went on to say, "our most urgent challenge is to communicate the joy born of faith and the experience of God's love." He went on to comment on the nature of cathedrals. 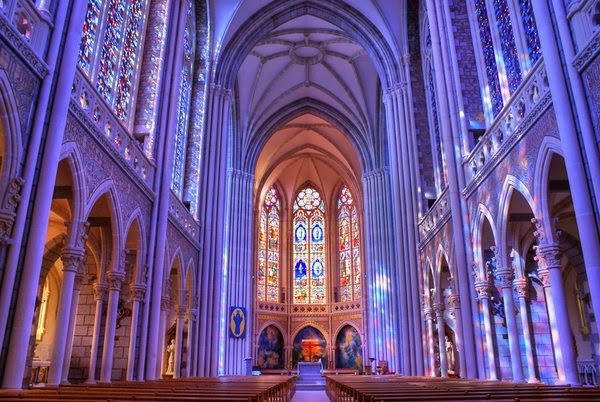 He said that from the outside, the windows look dark and dreary, but when viewed from the inside, they come alive and reveal their true splendor. He said that this is an image of the Church. From the outside, it can seem dreary and foreboding. But, when lived from the inside, it is an experience of grace and life. In the face of what is a large-scale institutional deficiency, we have to figure out where to begin. John Paul II, Benedict, and now Francis have all, in their own way, shown us where we need to begin. We need to begin again from Christ. We need to begin from the inside. It's not too often that I use this blog to look for help. Probably twice a year I mention the needs of the Catholic Center. This is one of those times. No! Don't stop reading. Come on, at least read it! One of the things that's great about the Catholic Center at Boston University is that once people come through the door, they find a home here. They find friends, a community, a place to pray, a place to study, a place to grow in their Faith and in a life committed to the Sacraments. Once they are in the door, something great happens. But, the biggest challenge is getting somebody to cross that threshold. 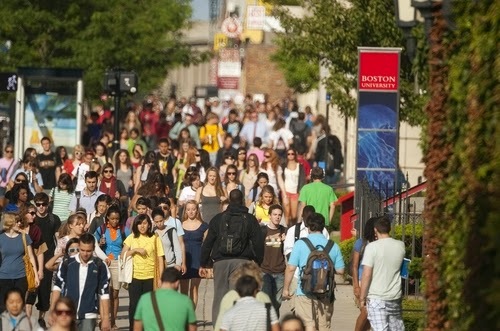 There are over 30,000 graduate and undergraduate students at Boston University. That is a lot of young people all in one place! I feel compelled to reach out to as many of them as I possibly can. But that isn't so easy. I've been thinking about making the first floor of our Newman House into a kind of coffee house. (Maybe Newman's Own would want to sponsor us . . . ). What I envision is some coffee house style tables and chairs, some comfortable furniture, lighting etc. I'd like to make it a place where students--Catholics and others--would feel comfortable coming to study, hang out, and maybe talk about important things. So, I've had a great idea. I've got no money actually to pay for it and I have limited interior decorating skills. So, that's where someone who reads this might come in. So, basically I've had a great idea and all I actually need now is materials and labor. I've done the hard work already....thinking of the idea. So . . . . .
Do you have money that you are dying to donate to a good cause? Do you have expertise in "Coffee House" decorating? Do you know somebody who has money that they want to donate? Money that they'd like to see go towards the work of evangelization? Money that would go to funding the Newman Center in the midst of a secular university located in the midst of a secular city? Do you have leads on somebody who might have access to the type of furniture that I'm looking for? Now, I don't want it to look like we went to a Yard Sale and picked up mismatched furniture. It has to be something that is intelligently designed and actually matches and is welcoming. Getting people in the door is the hard part. Once they are here, we know what we are doing. Creating an environment where students would feel comfortable coming in, studying together, and having a cup of coffee together would be the first step in evangelizing them. I'm an idea guy. But, I'm not a rich idea guy! I'm a poor guy with good ideas. And, I'm not a clever or flashy fundraiser. There have been a few times when I've had the feeling that I have now. The first was buying a new creche for my old parish church. We had a million dollar debt at the time, but I felt like the creche we had was too small. We decided to go for it and people came out of the woodwork to buy a magnificent manger scene for the Church. It was truly beautiful and is something that continues to move hearts. The second time was the crazy idea of painting a huge church. A couple of years previously, we had a million dollar debt, but in the following years, we had raised so much money that we thought we should do something grand with it. So, we painted the church and it came out magnificently. The third time I had this feeling was when we started daily adoration in my previous parish. Twelve hours a day each weekday. It seemed too big of a project, but it brought extraordinary graces to the life of that parish, including many vocations to the priesthood. So, I've got that feeling again. I keep hoping that the BU Catholic Center gets that "big donor" some day who will fund our evangelization needs. Until then, I need to beg everyone. I just ask you to offer what you can. If it is expertise, money, connections, or even a "share" on your Facebook or Twitter accounts. Who knows who will see this plea? Maybe some organization is interested in doing something like this and using it as a model. Maybe some BU Alum wants to help. Maybe some person interested in the New Evangelization is looking for a pilot program. Maybe some organization that sponsors campus ministry programs will help. Please give this post a "share." Please. When we purchased the Nativity Scene for my previous parish, the supplier told me not to worry because "people love to buy Nativity Scenes." I recognize that "a coffee house" is not quite as sentimental as a Nativity Scene. But, I think it may be a very fruitful means of evangelization. If we get young people in the door of the Catholic Center at Boston University, maybe some day they will find themselves kneeling before a Nativity Scene in a parish church. We need to get them now. The people who frequent the Catholic Center also frequent the Holy Mass and the Sacrament of Confession. If some nice tables, chairs, lighting, and coffee gets them into the door, I trust that the confession line and the communion line will also grow. Again--30,000 young people walk by our door each day! I'd like to create something beautiful, welcoming, and evangelistic. That's the idea. Can you help? If it works, I praise God. If it doesn't, then I trust it was not His Will. But, I think I'm on to something. I hope in the not too distant future to see more young people at the BU Catholic Center because some of you made that happen. Donating directly makes us the most money, but all donations are welcome! Since learning of John's death last Friday, probably like all of you, I have thought about little else. And, perhaps like all of you, the more I think about it, the less comprehensible John's death becomes. I see John in his cassock and surplice serving Mass at this altar. I see John coming down the stairs after Mass here just a few weeks ago. I hear all of those who knew him repeat the same things over and over again. Intelligent, generous, caring, kind. The more I think of John and all of his good qualities, the more I am confounded by the nature of his death. John was intelligent; his death, senseless. John was gentle; his death, traumatic. John was generous, kind, and compassionate. Yet his death deprives us all of his presence. John was a young man whose life was filled with such promise; his death cuts short all of that promise. John was given a family who deeply loved him; his death leaves them without him. John was a young man who prayed, who received the Sacraments, and who listened to God's Word. And yet, his death is not what God willed for him. I so wish that today I could stand here and make sense of John's death, but I am at a loss. We will never arrive at a moment when we will be able to say that his death now makes sense to us. This is among the sufferings that we will all have to carry. As if this suffering were not enough, we all carry another weight today. We wonder if somehow we are at fault. Did we not love him enough? Did we not teach him well enough? Did we fail to notice his struggles? Should we have called, reached out, and encouraged him more? Could we have better proved our love for him and better communicated how much we valued his presence? I have found myself wondering whether had I preached better homilies or taught him better in religion class if this would have changed things. Perhaps all of us ask these questions to one degree or another. These questions--mostly unfounded and without merit--only deepen our grief. They will only immerse us further into the abyss of darkness. What then can we say? Is there anything worth saying? There is. As difficult as it may be because we are shocked by the suddenness and tragedy of John's death, we must not become fixated upon it. Instead, we must direct our gaze upon the face of the Good Shepherd. We must look toward the Good Shepherd and learn from him because he is gentle and humble of heart, and we will find rest for ourselves, for his yoke is easy and his burden light. Today, we find ourselves in what the 23rd Psalm describes as the "valley of the shadow of death." We are enveloped by the darkness of grief, but even in the midst of the darkness, we hear the voice of the Good Shepherd. He is at our side, leading us and nourishing us. We all need the Good Shepherd because he alone can nourish and refresh our souls. He alone can lead us through the dark valley of grief and into the green pastures of hope. Yes, we need to fix our eyes on Jesus, the Good Shepherd, and trust in his great love and in his great mercy. Today, very little makes sense to us. None of us will ever know what was in John's heart in those last moment's of his life. But one thing I do know, and of this I am convinced: Jesus, the Good Shepherd loves John more than any of us can possibly imagine. He loves all of us more than we can imagine. In the midst of so much turmoil, confusion, and tragedy, let us listen to the voice of the Good Shepherd and follow where he leads us. Every other path that we take will lead us only further away from peace. We mustn't follow the path of perpetually pondering the nature of John's death because this will only deepen our grief and increase our confusion. Instead, we must listen attentively to the voice of the Good Shepherd--for he knows his sheep and he knows how to care for them. In today's Holy Mass, we pray for our dear brother John, whom we deeply love; John who somehow lost his way and became ensnared in a terrible anguish. We know and have confidence that Christ the Good Shepherd immediately went out in search of this lost sheep. We who love John must now dedicate ourselves to praying for him. This is how Christians love one another. 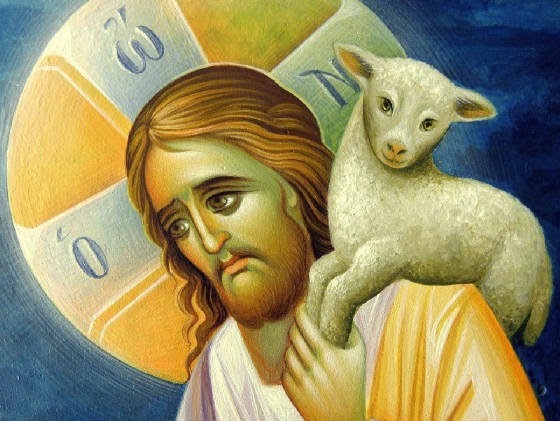 In every Mass that the Church will offer until the end of time, she will remember John and pray that Christ the merciful shepherd will place this lost sheep in his arms and carry him safely to the home of the Father. May the Mass we offer today win pardon for our brother, bring consolation to his good parents, his sister, and to all those whose hearts are broken.